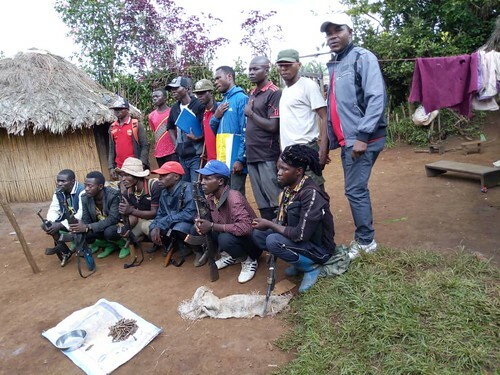 Kalehe, South Kivu, DR Congo – Thirteen Raiya Mutomboki fighters and their leader, self-proclaimed colonel Safari Ngorongo from Chaminunu village, in Kalehe territory, surrendered on March 26, 2019 with 6 weapons (AK-47) and 95 ammunition to MONUSCO. Kalehe, Sud-Kivu, RD Congo – Treize combattants Raiya Mutomboki et leur chef, le colonel auto proclamé Safari Ngorongo venus du village Chaminunu dans le Territoire de Kalehe, se sont rendus à la MONUSCO le 26 mars 2019 avec 6 armes (AK-47) et 95 munitions. Leur reddition est le résultat de sensibilisations de la Section de désarmement (DDR/RR-CVR) de la MONUSCO. Photo MONUSCO/Tresor PENDEKI. Kalehe, South Kivu, DR Congo – Thirteen Raiya Mutomboki fighters and their leader, self-proclaimed colonel Safari Ngorongo from Chaminunu village, in Kalehe territory, surrendered on March 26, 2019 with 6 weapons (AK-47) and 95 ammunition to MONUSCO. Their surrender is the result of sensitization by the MONUSCO disarmament section (DDR / RR-CVR). Photo MONUSCO / Tresor PENDEKI.